Bank Holiday Monday 1st May: Arthur Greatwich Singles Handicap. 17.45 scratch. More details are on the Competitions page. Well done to Geoff Carnell & Pete Driver who lifted the Mid-Shropshire Seniors Doubles Trophy at Sinclair yesterday. 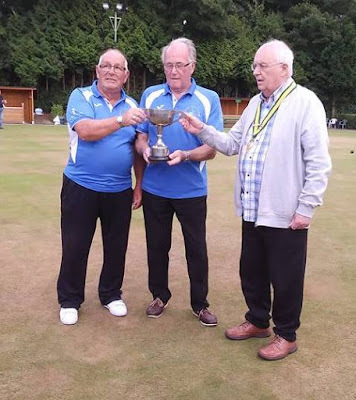 Pictured are Geoff & Pete receiving the cup from League President Nick Stacey. 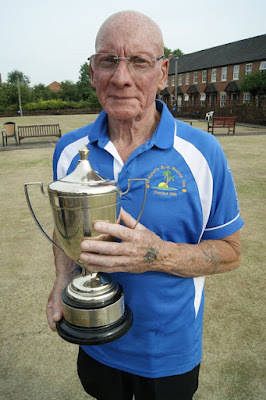 Congratulations and very well done to Tony Steadman on winning the County Veteran's Merit at Greenfields BC this week. As discussed at the Bowling Meeting, Rob Fuller has been arranging the supply of new club shirts, jackets etc. If you remember, it was hoped that all members would purchase (at least) a shirt. Sample garments should be available for viewing in the club shortly and an list will be posted so that we can do a bulk order and avoid postage charges. They can now be viewed and ordered here. Note that orders placed directly on the web site will incur charges for postage unless you can arrange collection from Hortonwood in Telford. The 2017 AGM will be held on Tuesday 14th February at 8.30pm in the club. Prospective new members are welcome to attend.